The main and most popular walk is long but worth the 3.8km hike (one way) to Motor Car Falls. You will find yourself following the sound of water cascading over the rock face of the waterfall into a deep plunge pool below. If you are after a real outback adventure look no further than the Yurmikmik Walks. The Yurmikmik Walks are an ultimate outback experience and are accessible year round! Located in Kakadu National Park, the bush walking trails in this area are second to none, particularly in the Wet Season. Yurmikmik can be found along Gimbat Road, which is sign posted as the Gunlom turn off on the Kakadu Highway, approximately 140 km south from the township of Jabiru. Another 22 km down Gimbat Road on the right is the beginning of the Yurmikmik Walks. There is a spacious car park with picnic tables and clear signage illustrating each of the walks including Motor Car Falls, Boulder Creek, Kurrundie Creek and Yurmikmik Lookout. The main and most popular walk is long but worth the 3.8 km hike (one way) to Motor Car Falls. The walk is graded as moderate by Kakadu National Park. For the most part it is an easy well marked track, although there is little shade. The last 10 minutes of the walk is a scramble over rocks however you will find yourself following the sound of water cascading over the rock face of the waterfall into a deep plunge pool below. If the waterfall is flowing with gusto the plunge pool will be crystal clear and you may be lucky enough to spot long neck turtles, small fish and cherubin. Swim across the pristine pool to sit under the spray of the waterfall and explore the small cave within the crevice of the rock face. Towards the end of the dry season this waterfall may cease to flow. Boulder Creek, also part of the Yurmikmik Walks, is a hidden gem and consists of a lot shorter trail than Motor Car Falls, 2 km return. This double waterfall is a treasure of the Territory and worth the picturesque walk. During the wet season you will feel like you need additional eye protection from the intense green of the flora. 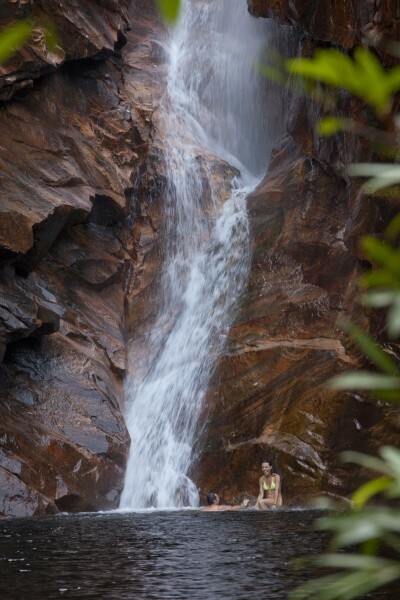 The abundance of water cascading down the waterfall is the perfect place to cool off in both the top and bottom pools. The walk to the bottom of the waterfall is relatively easy however it is a scramble over rocks to reach the top pool which is moderate. Kurrundie Creek walk is for the committed adventurer. Very few people venture upon the 11 km return walk (7 hours). Kurrundie is a spectacular network of waterfalls, however Kakadu National Park grades this walk as Difficult and the track is unmarked. Plan your walk early in the morning to avoid the heat of the day and take plenty of water. Permit only camping is available at this site. Distance: 162 kms South of Jabiru. Drive South along the Kakadu Highway, turning off at Gimbat Road (Gunlom). Clear signage indicates the Yurmikmik walks located on your right along Gimbat Road. Limited Facilities: Carpark, picnic tables. Bring your own drinking water. Camping: A permit is required to camp in this area. There are no toilets or showers. Access: In general Yurmikmik Walks are accessible all year round. 2WD access during the Dry Season, May to September. Check with Bowali Visitor Centre accessibility in the Wet Season – October to May.